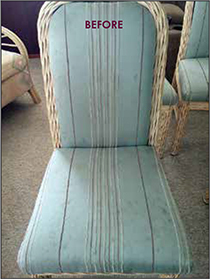 Magic Carpet & Furniture Cleaning is equipped to professionally clean your upholstery as well as most outdoor patio furniture. Our process is safe for all fabrics except (Silk and Rayon). As much as we enjoy our children and pets we know how messy they can be at times. There is no better way to clean, sanitize and remove allergens from your furniture than our low moisture Dri Foam process. 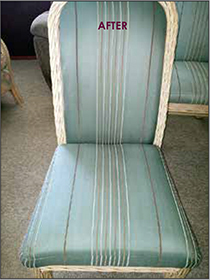 Leather upholstery can also be cleaned with our Dri Foam process. Once the furniture has been cleaned we condition, moisturize and protect your fine leather with a leather lotion which has a rich leather aroma. 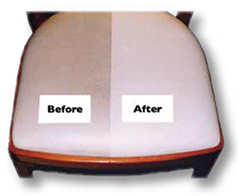 For a clean and dry upholstery that looks its best every day we use a simple and fast method for deep cleaning your upholstered furniture. This method does not have the inconvenience of getting your beloved furniture wet. It is great for cleaning all types of fabrics including velvet, jacquard, weaves, tapestry, brocades and even leather! Your Furniture Is Dry And Back In Service In 30 Minutes!